There are many different types of headaches, but of all the people with headaches out there 90% of them have cervicogenic (tension) headaches. These are headaches caused by a poorly functioning neck. These are usually described as tightness, stiffness, or a pressure. There are other kinds of headaches, migraines for example are periodic, severe, throbbing headaches that usually last more than a few hours, but less than a day. They can make the sufferer sensitive to light and sound, and cause nausea even vomiting. Migraines affect women more often than men. Migraines are commonly heard of and talked about because of their severity, but are much more rare than cervicogenic headaches. Billions of dollars are spent on headaches each year in the United States. Headaches are a major cause of lost productivity and time off work. One of the top reasons for seeking treatment, headaches are big money for drug companies, and big losses to businesses. People can end up with a headache from stress, a car accident, whiplash, or any kind of trauma. Headaches can occur a day or even weeks after the initial injury due to the cumulative nature of those kinds of injuries. Many people think their headaches come on for no reason at all, but if they think back they will remember an accident, increased stress, playing to hard on the weekend, or something a few days ago. 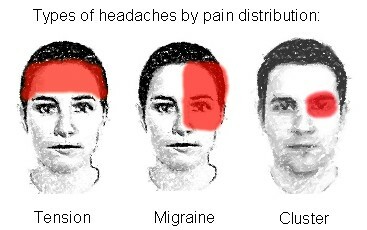 Chiropractic has a great success rate with treating headaches. It has been found to be better at providing pain relief (with less side effects) and reducing frequency than medication. Chiropractic addresses the root cause rather than just the symptoms. When treating your headaches your chiropractor (which could be me if you’re in Utah) should be addressing 3 major things: First reducing the pain, second improving neck function overall, and third proper strengthening of the neck to reduce future risk of re-injury. While chiropractic is particularly good at resolving cervicogenic headaches it has also been shown to be effective with some types of migraines, and other headaches. If you are experiencing headaches, don’t reach for that Aspirin bottle. Reach for the phone and contact your chiropractor. You will receive better, safer relief, and have less chance of recurrence. This entry was posted in Chiropractic in General, Chiropractic Research and tagged car accident, cervicogenic, Chiropractic, Chiropractor, headache, medicine, NSAID, Orem, Provo, relief, tension headache, Utah, whiplash on July 16, 2008 by cmnacnud.